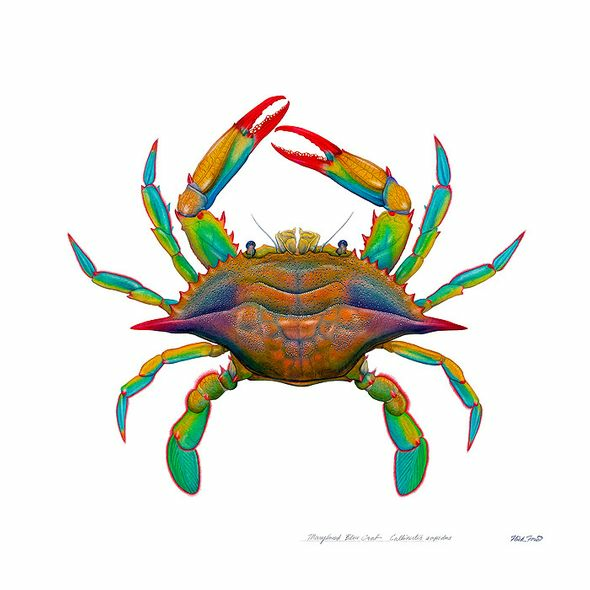 Flick Ford Artist Signed and Numbered MasterWork™ Canvas Giclee:"Maryland Blue Crab"
About The Artist : Flick Ford fell in love with fishing at age five. His father, an accomplished fly-fisherman and talented commercial artist/copywriter, instilled in him a deep respect for nature and nurtured his early creativity. Born in 1954 in Atlanta, Flick was raised in Westchester County, New York. Throughout the 1960s and 1970s Flick fished the Adirondacks, New England, Long Island Sound, Chesapeake Bay, Virginia and the woodland lakes of Quebec, while pursuing two other loves: music (as lead singer in a garage rock band) and art. He took formal watercolor classes in the 1960s; figure drawing and graphic design classes from 1973 to 1976 and then studied art at Evergreen State College in Washington State. Flick moved to New York City in 1978 and dove into the audio/visual scene including indie film, video, underground publishing, cartooning, illustration as well as reconnecting with music. He performed in the East Village with several bands, and wrote and sang lead in The Crazy Pages for almost twenty years. Ford left New York in 1993, heading for the Hudson Highlands where he quickly became obsessed with fishing the NYC watershed. As he branched out to many of the brook trout places where he had previously fished in parts of the Adirondacks and Vermont, the effects of over twenty years of pollution, over- development and acid rain became painfully apparent. "I felt I should start to keep a record of the fish I caught and decided to do it in watercolor paintings. I just want to catch and paint these fish, and show how they appear to me in all their iridescent beauty." Today Ford makes his home in Putnam County, New York. He fishes more than 100 days a year and ties his own flies. He selects early every fish he paints for its relative size and beauty. After landing a fish, he quickly gets a digital photo before the colors fade, carefully measures it in all dimensions, sketches details, counts scales, fin rays and finally traces it to get its actual outline. He has developed a technique of successive washes utilizing masking friskets and painstakingly detailed dry brush that make these fish truly come to life.